RETIRED FIREFIGHTER'S ASSOCIATION OF WASHINGTON, D.C. This page is designed to keep the retired members up to date on issues, from a "Sick List" to Pending Legislation and anything else we can think of. Hopefully anyone reading this will pass the word around to all other retired members. This is here for your use. To sign up for our e-mail blasts scroll to the bottom of this page and fill out the form. Hit the subscribe button only once! Supplemental Dental and Vision plans will be with "United Healthcare"
Happy Birthday to RFA Life Member Bill Dawson!! Thank you for your service to your country and community!! Donald "Rip" Gardiner is putting on a birthday party for Bill Dawson on 4/18/19 at noon at the American Legion 6265 Brandywine Rd. Hughesville, Md. Bill will be 94 that day. There is now a Washington DC Fire Fighters Memorial Foundation this is a 501c non profit. They are collecting money to put up a permanent memorial to the Fallen DC Firefighters. They are looking for sites, getting permits, hiring an artist to design the memorial. It is all in the early stages, but money is needed to get things moving. "I just left Bill. He said he thought he was going to die. I did too but I didn't t ell him. He will be transfered back to the Charleston at 1pm today"
Just wanted to give you guys an update on Bill Dawson. Bill is at La Plata Hospital and not doing well. He has pneumonia and very weak. They have decided to send him back to his place at the Charleston in Waldorf this week under hospice care. He seems to do much better when visitors stop in to engage in conversation. Right now he is in room #3606 east wing at La Plata. Not sure when this week they are sending him back to The Charleston. My girl Jeanne made him some home made custard, his favorite. Spoke to his Dr last night and he said it could be a few weeks or a few months, I guess it all depends on his will to live right now but I can tell you as much as he wants to go, he is getting tired. Hope guys can make it in there to see him, he would love that. Ron Tyler presented tax forms at the RFA Meeting last Monday. He had taken to his tax accountant regarding the Maryland Home Town Heroes Act. Ron's accountant said he was eligible to take the deduction. The RFA has heard different accounts of who is eligible. The RFA strongly recommends talking to a tax accountant or lawyer to get a decision before taking the deduction. Below are the forms Ron brought to the meeting. The RFA regrets to inform our members of the death of RFA Member Gerald J. Petras. Brother Petras passed away on March 13, 2019 from COPD. Brother Petras was 82 years old. Brother Petras retired from the DCFD on 08-25-1991 as the 2nd BFC. Funeral Services have already taken place. Brother Petras was laid to rest at St. Mary's Refuge of Sinners in Cambridge Md. Once again the Florida Reunion was a huge success!! A big thank you to AJ Winterwerp for putting this whole thing together. This was AJ's last year. Next year Joe Rainwater is taking over. The reunion next year will be in Punta Gorda Florida!! RFA LM Harry Twigger has been moved to a nursing home. He is suffering from severe dementia. Update on John Grolig. He is back at the Washington Hospital Center, for his third surgery, which is scheduled for today. They are removing his replacement hip - it dislocated again and infection set in. Hopefully the third time will be a charm and the new replacement will take this time. Below is the motion that was requested at the April meeting by Bill Mould and the committee working on our pension issues. The motion was made and passed unanimously. President Scherer read the names of the members who passed away since our last meeting. Jimmy Partridge was absent. No Secretary’s report or minutes from last meeting. Stefan Ventura gave the membership report. Officers have been working together to get all of these issues resolved. have to pay taxes on the overpayment. The last one should be resolved soon. A retired MPD officer has gone to court on his own to get relief from the audit and reduction of his benefits. The court ruled in his favor, but the Govt. has appealed. Bill Mould requested $10,000.00 to be used to hire an attorney to look into the merits of his case and see what he would recommend our next course of action should be. This money might not be necessary if the International Fire Fighters Assoc. attorney takes the case for us. Members who retired but were owned money from the last contract still have not received their money. The Local is aware of the situation, and staying on top of it. More info will be posted once it becomes available. 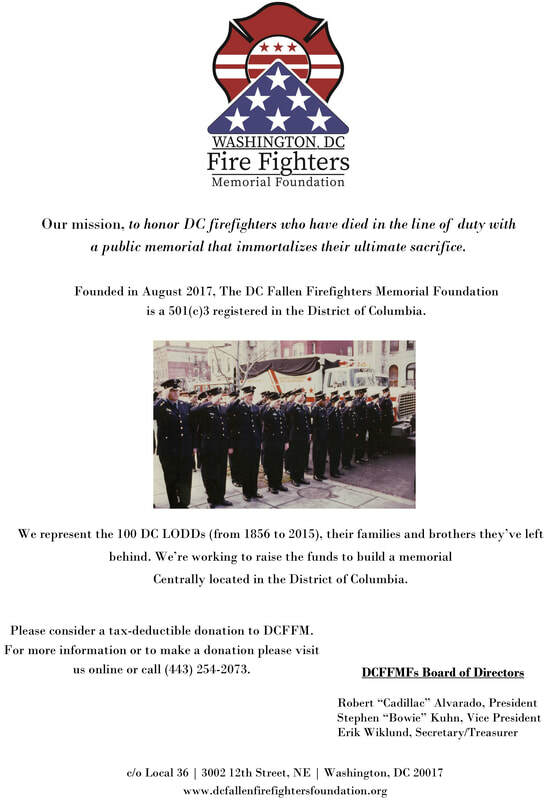 There is now a Washington DC Fire Fighters Memorial Foundation this is a 501c non profit. They are collecting money to put up a permanent memorial to the Fallen DC Firefighters. They are looking for sites, getting permits, hiring an artist to design the memorial. It is all in the early stages, but money is needed to get things moving. A link to their website will be posted on our website. Local 36 is negotiating a new Dental and Vision contract. RFA members should be able to join in on the contact once it is finalized. The DC Firefighters Burn Foundation is hold a “Night at the Market” as a fund raiser to be held on Sat. May 18th 7 to 11 PM Eastern Market 225 7thSt. SE. See Below for more info. The RFA now has a Twitter account and Facebook page to better get the message out. A huge thanks to newly elected Sec. Jimmy Partridge for putting these pages together. We hope that the more ways to communicate the better. People use different platforms to keep in touch, so we hope to get any new or information out to everybody in as many different ways as possible. For those of you how use these types of social media, please add them to your accounts. In an effort to provide our retired brothers (at the time of their demise) with a dignified, and respectable presence, the Retired Association has decided to organize a "Honor Guard". This will not be a precision - spit and polish - drill team type concept, but simply a list of retired brother firefighters who may have known and worked with the departed, or at least served during the same time frame. Participation by this Honor Guard will be ONLY By request of the family, and only to the extent that the family desires. To include but not limited to pallbearers, (active or honorary) - liaison between the family and visiting fire fighters, or simply lending a fire service presence. The "uniform of the day" for this honor guard shall from this day forward be known as the "Lockrow Suit" which will consist of a navy blue blazer, white shirt, gray slacks, and black shoes (properly polished) and official Honor Guard tie issued by the Association. For those who wish to participate, and do not own a "Lockrow Suit" we have made arrangements with "Men's Warehouse" for a very good discount on the blazer and slacks. The more members who participate in this honor guard will provide for a large cadre to draw from meaning less travel and less frequent events. Please give this Honor Guard serious consideration, and join us in providing our departed members with class, dignity, and proper respect. Thanks to Jimmy Martin, the link has been fixed. They advised that if you are still having problems, to turn off your pop-up blocker. Friendship Fire Assn. Celebrates 75 Years of Dedicated Service to the DCFD. 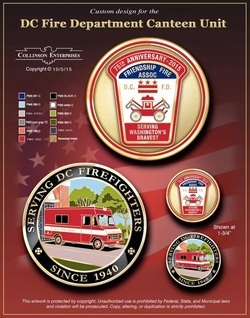 Challenge Coin is available for a $10 Donation.Thanks to All For Your Support and the Privilege to be a part of our Great Department , The DCFD. To Obtain Coins Contact Elliot 301-807-8192 , Vito or any FFA Member. Meetings are held the first Monday of each month 11:00 hrs. except July, August and September. IF SNOW CLOSES OR DELAYS THE PRINCE GEORGE'S SCHOOL SYSTEM , THERE WILL BE NO RFA MEETING THAT DAY. Once filled out click the Subscribe button only once! !